We were chatting about the importance of customer experience recently and were surprised at the low number of retailers that actually invest in it. Kerry, with her infinite wisdom, has compiled some of her insights into this befuddling topic. In recent years, customer experience has taken centre stage in discussions about retail success – as it should. And it’s definitely not a new topic – every person in retail will wax lyrical about how important the customer and their experience is. So, it seems really obvious for retailers to focus their attention on improving customer experience, right? Customer behavioural theory has been around for ages (even in its most unsophisticated form). Doesn’t that mean retailers should be doing it by now? What’s Standing in the Way of Your Customers’ Happiness? At one time or another, we’ve all experienced the frustration of waiting in a queue because only 2 out of 12 tills are open. And while standing there, we’ve wondered why nobody has bothered to think of the customer. 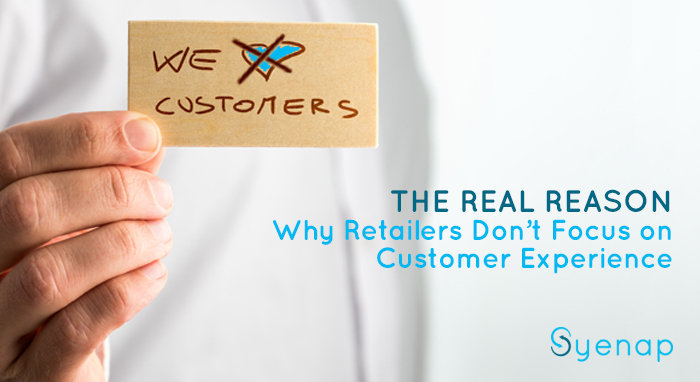 So what has been stopping retailers from focussing on how customers experience their stores? The answer is quite simple, one of the most prominent reasons retailers don’t consider their customers is… drum roll please…COSTS! Yup, retailers’ bottom lines are getting in the way of their customers’ happiness. Everyone seems to think that investing in a truly incredible customer experience strategy is expensive. It can be. But it doesn’t have to be. In simply shifting focus and prioritising the customer, you’ll find that in the long run, you’ll make enough revenue to cover what you thought you’d be losing and then some. The desire to improve the customer experience is often at odds with traditional operational metrics. And, in fact, 79% of consumers said that reducing costs and improving margins is still crucial. So, how can you do both and still keep your head above water? While this may be easier said than done, there are multiple strategies that you can implement to make your customers feel important. And, let’s face it, a valued customer is sure to return time and time again. Targeted marketing campaigns – Do you know who your customers are? If you do, you can market products and services accordingly. If your marketing efforts are directed at the wrong customers, they won’t buy what you’re selling. Software – Retail analytics software like Syenap is designed to be customer-centric. It tracks consumer shopping behaviour, high traffic areas of your store, and busy times of the day so you don’t have to. With the backing of true big data, you can craft solutions accordingly and deliver a worthwhile experience to your customers. Personalisation – Your customers should feel like everything you do is to serve their needs. Your social media brand pages are excellent spaces in which you can get a feel for what your customers actually want from you. You can extend this into your email marketing as well (if it’s a part of your current marketing strategy). They say that you should teach people how to treat you. And this is true. But you should also teach your staff how to treat your customers. Train them on how to provide the absolute best customer service possible, and make sure that you always keep them in check. In a recent blog, we discussed how vital it is that businesses start to look at technology to solve customer gripes. And we stick by all the points we made. Customers have made it abundantly clear that they expect retailers to invest in technology to solve their problems. Like the option of clothing stores using Virtual Reality to enrich and personalise the shopping experience. Prefer using an app to find detailed information about product components and ingredients before they make a purchase. Want a near real-time delivery of purchased goods by drones. And so to sum up the current retail conundrum – retailers can choose to focus purely on KPIs, costs, and numbers, or they should decide to be the retailer that truly does put the customer before everything else. Does this mean that cost savings and operational efficiencies go out the window? Absolutely not. But, what it does mean is that customer loyalty needs to be established before anything else, and that will always be the ultimate competitive advantage.